Ok, so clearly my sense of time is not quite right as I meant to write my follow-up post, oh um, on Tuesday! Can I just say, this week has been a week! I have been dealing with insurance stuff from a car accident 2 weeks ago - just when you think things are going smoothly then you get the call "Maam', your car has been totaled." Not the call I wanted. But this is when you start counting all of your blessing - great hubby, cute puppies, 19 awesome kiddos willing and wanting to learn! 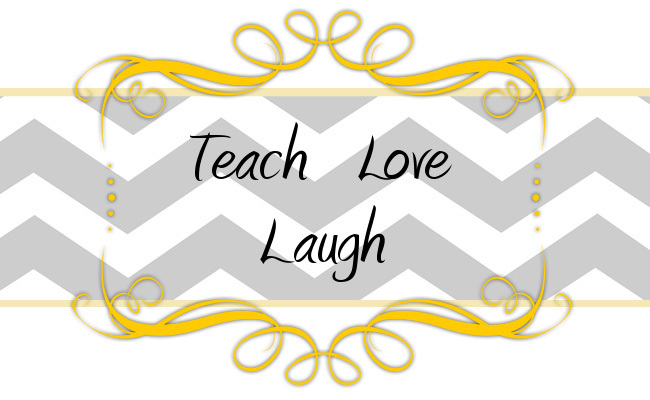 So yes, stress is there, but I am all smiles today in my classroom! First, put I bought the small Easter eggs, the tiny ones that will fit on a plastic spoon. 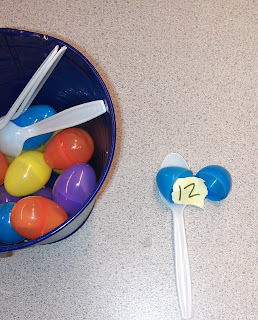 I put a number in the egg, and the student teams were challenged to write a fact family using that number as the whole (or we call it the daddy number). The students had to bunny hop to the bucket, put an egg on a plastic spoon and tiptoe back to their team. Each member of the team wrote a fact family on their own white board (you could use a paper recording sheet if you would like). Once all members had their fact families written down, they raised their hands in the air and I checked their work. If it was correct, they would tiptoe back to egg bucket and put a new egg on their spoon. If they were not correct, they would fix and then head to bucket! What do you do in math to help combat Spring Fever? Thank you! What did you guys do with eggs? I definitely try to do hands on activities. It seems to calm them down, and they don't even realize their learning! I think hands on is the best whenever possible, especially for these young kiddos! Super fun game. Bet they LOVED it! This is so cute! Did each team member get their own egg and write their own fact family or did each group get an egg and one person each wrote one fact to contribute? 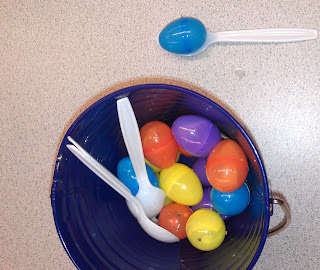 I had a purple bucket set up and each team had to send a player (bunny hop style) to get an egg on their spoon and then tiptoe back with it. Everyone on the team had their own whiteboard and they wrote down a fact family for the number that was inside the egg. This way, everyone was involved! They couldn't get a new egg without all hands in the air and a check with me that each member had a fact family down. It was a pretty cute activity! Thank you for the explanation! My class is going to love it!